Color is normally black, but also brownish black, orange, yellowish-orange and dark green. Crystal Habits include short prismatic crystals with a square cross-section and simple pyramidal terminations. Also massive, embedded irregular grains and reniform. Cleavage is poor, in two directions lengthwise, but is rarely seen. Specific Gravity is 4.1 - near 7. Streak is orange to brown. Other Characteristics: Nearly always metamict and always strongly radioactive. Associated Minerals include quartz, feldspars, biotite and betafite. Notable Occurrences are found at Langesundfjord, Norway; Bancroft, Ontario, Canada; Eifel District, Germany and Arizona, USA. Best Field Indicators are color, luster, crystal habit, fracture and especially radioactivity. 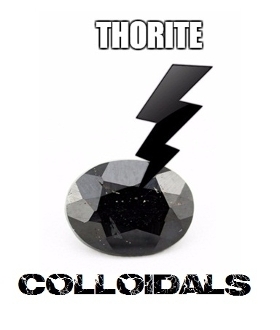 Thorite is the most common thorium mineral. Thorium is a highly radioactive element and could be used as a replacement for uranium in nuclear power generation. It is estimated to be three times as common as uranium and all the thorium in the Earth's crust could have more potential energy than both uranium and the fossil fuel reserves combined. Uranium and thorium are considered to be the primary sources of the internal heat of the Earth through their radioactive decay. Specimens of thorite generally come from igneouspegmatites and volcanic extrusive rocks, hydrothermal veins, contact metamorphic rocks, and as small grains found in detrital sands. Crystals are rare, but when found can produce nicely shaped short prismatic crystals with pyramidal terminations. Remember, this is a radioactive mineral and should be stored away from other minerals that are subject to damage from radioactivity and of course human exposure should be limited. This crystal is form Mogok, Product ID S2794. The Mogok Stone Tract in Upper Burma (Myanmar) has been known to produce exceptional gemstones especially rubies since centuries, with records of mining activities dating back to at least the 16th century. The picture is the actual thorium piece used in the electrolysis process. I used the same low voltage process that I use on all my metals to produce colloidals.